Dr. B.R. Ambedkar.the greatest Buddhist modern India produced was a genius who overcame difficult situations and upheld the right of the neglected sections of society, like the so called untouchables, Vishweshwar Hegde Kageri, District in-charge Minister of Uttara Kannada, said here in Karwar in the Uttara Kannada, India. Addressing a function to mark the 121st birth anniversary of Dr. Ambedkar, Mr. Kageri said Dr. Ambedkar fought evils of society by being a part of that society. He tried to guarantee self-respect for the downtrodden by being part of the same society which had denied all rights to them. Dr. Ambedkar had a great love for the culture of India and hence embraced Buddhism despite attempts by Muslims and Christians to lure him into their fold. Siddalingaiah, chairman of Kannada Book Authority, who was the main speaker, compared Ambedkar with Mahatma Gandhi and dwelt in detail on the differences the two had despite working towards the same goal — uplift of the downtrodden. He lauded the efforts of Ambedkar in bringing Dalits back to the mainstream of society by rediscovering their lost pride. Uday Naik, vice-president of Uttara Kannada Zilla Panchayat, and Inkanglo Jameer, Deputy Commissioner, also spoke. Ambedkar believed that the Mahar people to which he belonged were an ancient Buddhist community of India who had been forced to live outside villages as outcasts because they refused to renounce their Buddhist practices. He considered this to be why they became untouchables and he wrote a book on this topic, entitled Who were the Shudras?. 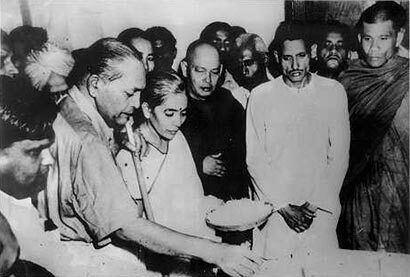 After meetings with the Sri Lankan Buddhist monk Hammalawa Saddhatissa, Ambedkar organised a formal public ceremony for himself and his supporters in Nagpur on 14 October 1956. Accepting the Three Refuges and Five Precepts from a Buddhist monk in the traditional manner, Ambedkar completed his own conversion, along with his wife Dr. Savita Ambedkar(née Sharada Kabir). He then proceeded to convert a large number (some 500,000) of his supporters who were gathered around him. He prescribed the 22 Vows for these converts, after the Three Jewels and Five Precepts. He then traveled to Kathmandu in Nepal to attend the Fourth World Buddhist Conference. His work on The Buddha or Karl Marx and “Revolution and counter-revolution in ancient India” remained incomplete. Ambedkar studied Buddhism all his life, and around 1950s, Ambedkar turned his attention fully to Buddhism and travelled to Sri Lanka (then Ceylon) to attend a convention of Buddhist scholars and monks. While dedicating a new Buddhist vihara near Pune, Ambedkar announced that he was writing a book on Buddhism, and that as soon as it was finished, he planned to make a formal conversion back to Buddhism. Ambedkar twice visited Burma in 1954; the second time in order to attend the third conference of the World Fellowship of Buddhists in Rangoon. In 1955, he founded the Bharatiya Bauddha Mahasabha, or the Buddhist Society of India. He completed his final work, The Buddha and His Dhamma, in 1956. It was published posthumously.